If you are looking for information on the Junk King franchise business opportunity, Junk King franchises or Junk King franchising, then you have come to the right place. If you do not achieve a minimum revenue goal of $125,000 in your first 12 months of business, we will refund 100% of your franchise fee on your first territory and allow you to return your franchise. You're in business for yourself, but not by yourself and we're willing to guarantee it. 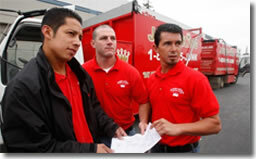 Junk King™ is a brand name that is easy for customers to remember and in two words describes what we are - a leader in the junk removal business. The Junk King brand has built lasting relationships with customers because we exceed their expectations and have gained their trust through exceptional performance that provides value. We build customer loyalty by treating the customer like royalty. We value our franchisees too. Junk King is a young, dynamic and ambitious company with the experience and the knowledge to succeed. If you are determined to work hard to make your business a success, you have come to the right place. We can show you how to make your kingdom thrive with our successful methods. At Junk King you'll be part of a fast-growing team of owners. There is a fast-growing demand for affordably priced junk removal. In today's economy, more people are improving their homes and making the most of their space rather than moving into bigger properties. Everyone has clutter and unwanted items, but few have the time or ability to dispose of it properly. Whether it's residential customers with two incomes and little time to clean out their garage, or a single mother who wants to turn an unused storage room into a home office, there is a demand for the service Junk King provides. We supply a strong, no-fail business model and best practices for every franchise operation. You don't have to spend time and money making mistakes. We show you how to get started, how to run your daily operations and how to hit the ground running to profitability. A state-of-the-art Customer Care Center. Our representatives perform critical customer tasks so you don't have to. They explain our services, schedule appointments and conduct post-job satisfaction surveys to help your business improve and thrive. This allows you to focus on your team, your vehicles and marketing your business. Ongoing coaching and mentoring throughout your first year, with a comprehensive assessment of your operations within 180 days of your business launch. At Junk King you will be a respected member of our Round Table of fellow business owners. Owner's hotline and owner's help desk will be there to support your kingdom at all times. Proven strategic marketing and public relations formulas. Reviews, including an annual summary of your operation. Our experienced advisors work with you to analyze your business so that you'll be crowned with success. Annual franchise meetings and online forums with franchise owners and operators. A comprehensive, 5-day training program. Week-by-week preparation for your business's opening day. Training for our state-of-the-art online software program. Marketing strategies, collateral and electronic artwork. Do you have what it takes to own your own Junk King franchise? We are looking for franchise owners who believe in building a brand that will accomplish their success, strong leaders with experience in management, marketing and sales. If you are a team player and hungry for success, then you should consider building your new kingdom with Junk King! Single and multi-unit franchises are available on all states.